1st, it would be cool to have some sort of table off to the side of this forum page for everyone to place links of peer-reviewed papers that are associated with LENR in genera. I plan on having all of the sensors that are required to measure real evidence.. But I have to start with the easiest and cheapest first, that is why I am logging VDC, Current, Vessel temp, ambient temp.... The geiger counter will come later, not too much later. Figuring out all of this stuff has been a somewhat enjoyable challenge. 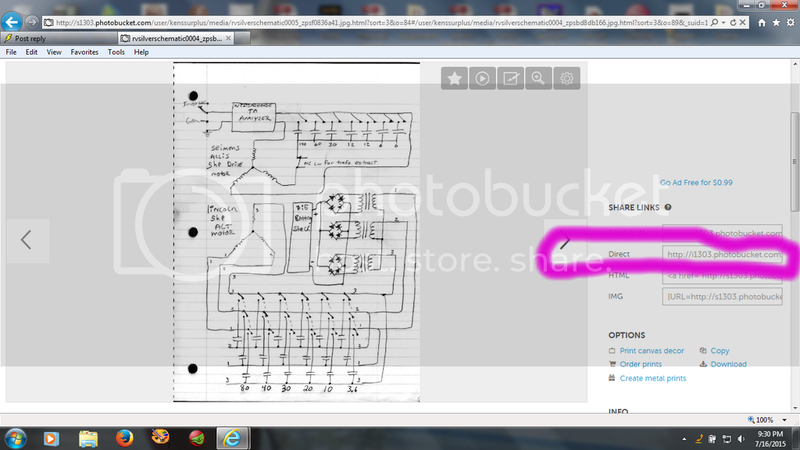 On my next post I will have a computer drawn (LTspice file) schematic and my arduino code file. If I do measure and calculate more Joules out than in (in the form of excess heat), I will be enticed to delve deeper, harder, faster, further. The picture attached is where my setup is this moment... In very short order I will have to do some thermal-co-efficient calculations and run some tests...Much to learn. I am using set 5V voltage reference for the Arduino using an LM358 op-amp IC... I am also providing a stable 5V for the thermistors(4 of them) via an LM358 set to 5V... It is coming along. interesting hardware project :) keep on! Thanks for letting me know that the link wasn't working... I will share a better picture than the one that was attache to the link later on tonight. Here is a link of what the setup I have functioning looks like. I have a text file that I can graph with spreadsheet software. This is the file of the first test run.. I have to still figure out how to do the math functions in spreadsheet software. I will have to draw up a schematic on the computer and share that file too. Here is some cell construction information and one of many interpretations of an apparatus. "Are you going to use a separate arduino for the PWM to the MOSFET? Or the same as the data logger." 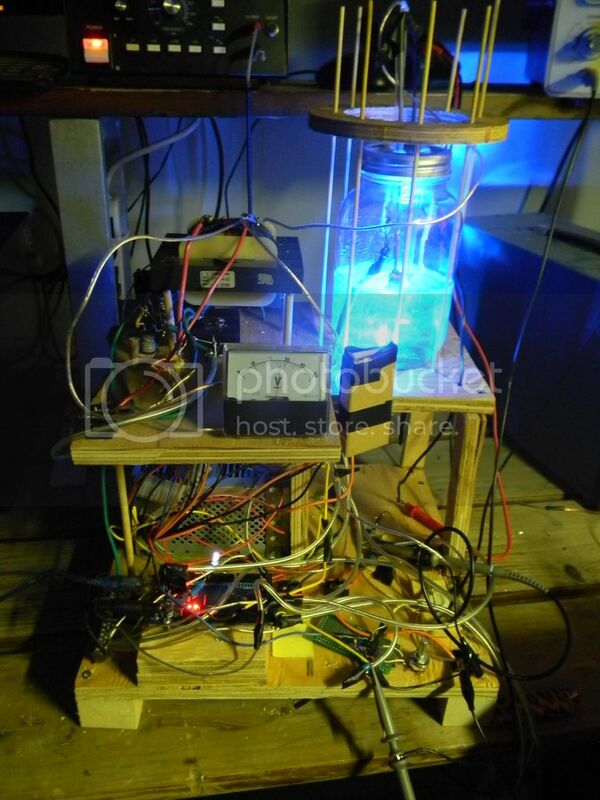 Yes, I hope to anyways... | really want to free up my variac for other projects and get this whole LENR/data logging apparatus in a neater, more compact, more portable configuration... If you/we could power the entire thing off of one ATX-PSU and one arduino board, well.. that would be kind of slick... I just wish I was better at coding with arduino.. or just coding in general for that matter. @benkomisar looking good. I could not access the spreadsheet / CSV file. I plan to play with thermistor today from another project but never need to use an amp with it before, i will look more in to it. I have a number of current sensors i should be able to use. What are you using for voltage sensor? It is just a voltage divider or are you using a component? Have you given a list of the parts you are using? ALso where do you think best place to stick my thermistor is? Submerged? I only have 1, but see you are using 4. I plan to log my data on to MySQL database and display on a web page with google charts. I could make it so it can be used by other people but it means having 24/7 internet connection and is risk if i lose internet no one can log data. There are online services so i've read that would be in the cloud so much more resilient than my server could be. Not sure which way to go yet and may just log to SD card first and then send data to web site just once a day. 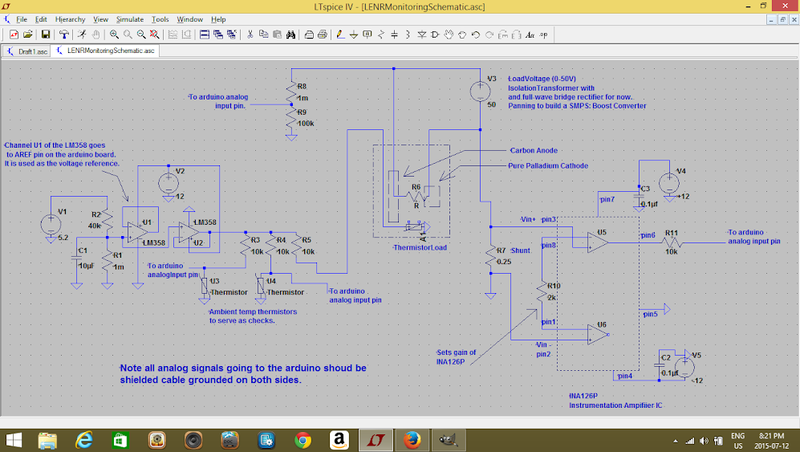 I am going to draw up on LTSpice a schematic with parts list on the file. I should have done that a long time ago.. I am logging the voltage via voltage divider (1M-100k) so my range is 0-55V that can be adjusted... I'm thinking for the SMPS: Boost Converter I am going to build, i am gong to try for a voltage range from 12-170V, we will see. I know you know this, but be sure to use an isolation transformer to power the load, the variac is not isolated. I will have an attachment to the LTSpice file once I figure out how to properly link this information in. The basics of it are that you have sensors of whatever type ( temp, current, voltage, flow, etc) run into an arduino, then the arduino processes that data, and ships it out to either a datalogging computer or an online web server. I set up a system a few years ago based on the original outdated / outmoded system that was not the modular design they show now. I used my system for solar hot water monitoring and control. It has 4 temp sensors and pump control, and I was going to implement solar tracking, P.V. power tracking as well as windmill monitoring and dump load control. I ran out of motivation. Here are my attempts:Open Energy Monitor - Kenssurplus' multiple energy source home. I have not followed the development of their new system much, but I think it would do whatever you wanted to do to monitor your cells or apparatus. Thanks kenssurplus. Will check that out. You are out pacing me at every step and I love it my friend. You inspire me to keep learning more and get this logger done. Right now I am unwinding a 6" toroid for an iso-transfromer and learning how to use CoolTerm to export serial too text. I been looking though Pulse Fire and Open energy like you suggested Ken. This seems a little easier for me to wrap my head around. I have not looked into MySQL Peter, might have to check that out as well. We have got a ton of work too do fellas and the more we share, the further we can find what works well. I have noticed in a fluid to get D2 to move past the -Cathode, a coanda action happens if the cathode is reactor centered and anode is on parameter. In theory, it should pass the heavy water to the outside of the chamber walls and then through the center like a vortex. Alright, well back to multi tasking and I hope you guys are all doing well. Keep on exploring possibility to its fullest. 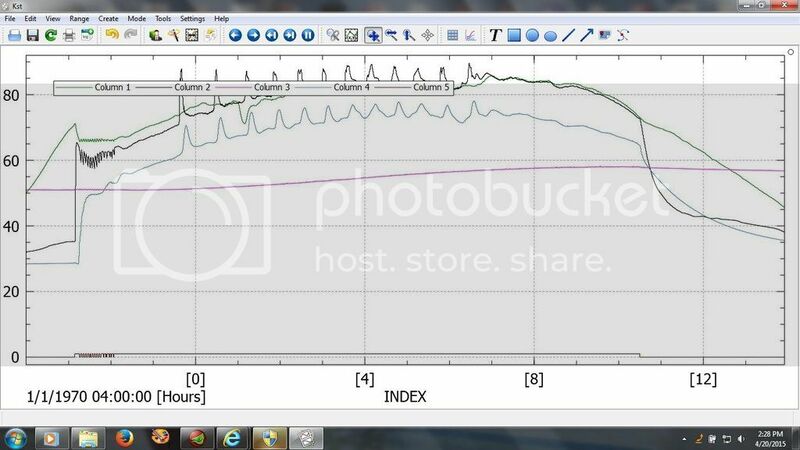 I thought I would show a sample of one of my datalogs from my solar hot water monitoring and control system. This is just to give you an idea of how to visualize your data stream. The Y (vertical) index indicates temp in C, while the X (horizontal) shows time. With KST, you can zoom into an area to investigate what happened at a particular time. The lowest line represents pump control (on/off), The red line represents the collection tank water temp. Green shows the solar collector panel air temp inside the panel. Black is the solar collector panel fluid out temp, and blue is the heat exchanger input inside the collection tank. This graph shows 5 data streams (could be much more, or less) for a day. I have run several days of data-logging, but then the amount of data points becomes quite large and starts to bog down an old ancient desktop computer that I use for logging. Anyway, hope this generates a spark of interest in someone. (puns always intended:-). Nice charts and cool system. How did you post the picture with it showing, all I can post (it seems) are links. When you compose a post, there is a small mona-lisa picture button on the very left bottom row of editor buttons. click that and it asks you for your URL to the picture. So, what I do is I have my pictures hosted at photobucket, not from my hard drive or by uploading directly to the forum. The URL link in the mona lisa button, just points the forum to where the picture is located at on the web, and the forum loads and displays the pics. At photobucket, I choose the image I want, then select it so that it is the only one showing. Then there are some sharing links given for the picture I want to share. I use the Direct link to paste into the mona lisa dialog. Oh, one other thing I forgot to mention is that try to convert all my pics to .bmp format (as some forums only accept that format - but right now I can't remember which forums). For this forum, I noticed that it accepts .jpg format as well. Since I am thinking about it, I will propose a caution. If you intend to use wireless sensor modules or have any other devices that emit rf (wireless link for a laptop, mobile phone, etc....) You may have some errors introduced from rf energy entering the cell. Also, if you are going to watch the emission spectrum from the test unit, then those same errors obviously would need to be excluded from the spectrum analyser readings. Great to have so many interested in this area. Keep at it. Thank you for the excellent well thought out and detailed response. I will be trying that photobucket-mona lisa process the next time I plan to share a picture. For right now I am just using a USB cord as the serial connection... I do want to try the rf serial port with this low power (non-plasma) configuration... If there is to much rf interference we can filter it (either by hardware or software) and if its too bad, we will just have to go back to the cable. Anyways, thanks again for the help Kenssurplus. This is a quick video of an experiment I did a few weeks ago, that show the effects of fluid motion in a liquid based reactor. Its a short boring video but you can see as the temperature and gas increase the resistance goes up, and stops the current from flowing by way of electromotive means. The energy transitions and then flows by way of thermal pressure. Gas production also plays a role in pressure differential ejecting the hotter fluid out of the polyvinyl graphite diaphragm on the top. The bottom also has a inlet for the fluid with the +Anode is connected. This design can be improved upon and utilized for many reasons. Just an interesting observation when I was doing experimenting with a diaphragm catalyst idea. Hey all, I have been thinking about sharing my conversations with Mr Norman Wootan about his cavitation pump experiement. So, I posted the exchange to my bench. It is related to the Cold Fusion or LENR area of investigation, by cavitation bubble vortexes (tornadoes) manifesting blue to UV plasma discharges. Interesting. Now you make me wish I would have used clear plastic tubing when I did my Mark LeClair experiment. I did see enough on the Inspector to know to leave this sort of thing for the big boys. Interesting stuff @Kenssurplus, I have heard of other suction based cavitation bubble collapse on aluminum sheet for alchemical transmutation... I think the guys experimenting with that method filed a patent and are going the commercial route... Very interesting.. In my opinion, these MIT course videos and the information outlined in them are the best proof on earth to date of OU phenomenon.. The great thing about Cold Fusion/LENR is that there is no violations of known and proven laws of thermodynamics involved. The energy gain are coming from conversions of tiny amounts of mass and converted into thermal energy.. This Cold Fusion/LENR stuff is the one true oasis for us alternative energy researchers. If anyone can show me where the grass is greener in this field (alternative energy) please let me know... And please don't show me data I can argue against in any way. If you are interested please take the time to carefully watch and listen to these videos. LENR/Cold Fusion is an oasis for alternative energy seekers, since mainstream scientist will be black-listed if they even express interest in this field of study, I feel it is up to us alternative energy hobbyist (who aren't reliant on grants and University money for our bread and butter) to take a serious look into this... I truly feel that with a concerted effort in being scientifically stringent, we can advance this field.. This is our oasis. The proof is in the nuclear pudding. Hey Ben, thanks for finding those videos. That is a lot of watching! I am only through the first day or so but very good info so far. There is deffinately something goin on both with the tech. as well as with the community, government, and business. Makes one think deeply.